Northwestern University men’s soccer entered Wednesday’s matchup against Wisconsin University with a win in at least one Big Ten game in 15 straight seasons. 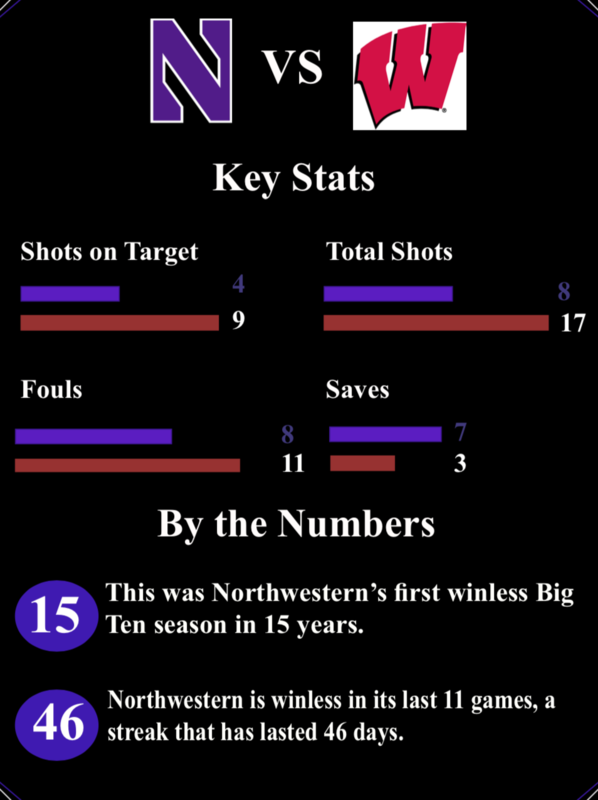 But last night’s match broke that streak in Northwestern’s last Big Ten game of the season. The Wildcats fell to the Badgers 2-1 in double overtime after a game-winning goal from Wisconsin’s Noah Melick resigned Northwestern to its first winless Big Ten season since 2003.For head coach Tim Lenahan, this was a prime opportunity for the team to get its first win. The loss moves the Wildcats to 4-8-5 overall with one game to play. After the loss last night, Northwestern finished with a Big Ten record of 0-5-3. The Wildcats are now winless in its last 11 games this season and haven’t felt that winning feeling in 46 days. But Lenahan added that his team’s record in the Big Ten is not entirely representative of the talent on the team. From the very beginning of the match, the Wildcats looked poised to pick up a win. For the majority of the first half and well into the second half, Northwestern dictated the pace of play and in a very defensive first half, generated more scoring opportunities than the Badgers. Northwestern broke through in the 66th minute when first-year player Jose Del Valle, a product out of the Real Madrid academy, placed a left-footed shot into the bottom right-hand corner, his first goal of the year. For the next 20 minutes, Northwestern appeared ready to pick up its first Big Ten win with sophomore goalkeeper Miha Miskovic getting close to his 9th shutout of the season. But with four minutes left to play, Wisconsin equalized after a shot rang off the post and rebounded back into play to forward Isaac Schlenker, who fired the rebound into the goal. After a scoreless first overtime, Wisconsin sealed Northwestern’s fate after a counter-attack secured Melick’s game-winning goal. But even with a tight loss, players struck an optimistic tone similar to Lenahan’s. Defender Garrett Opperman added that Northwestern has been making positive strides every game, and success will come if the defense tightens up. Northwestern will conclude its regular season Friday against Concordia-Chicago with its first Big Ten tournament match coming next Saturday against Ohio State.